The giants sit around their table. They make fun of their smallest brother calling him ‘Tiny.’ They propose a toast. Tiny/Anton drops a miniature harp on the table. His brothers tell him that he is too fascinated with humans. They believe humans to be violent. He sees humans as fascinating and does not believe that they are all bad. Carlos warns Anton that humans must never know that they still grow magic beans as he believes that they will use them to invade and conquer lands. Anton questions why they bother growing the beans if no one will ever use them. Carlos tells him that this is just what giants do and there does not have to be a purpose. Abraham taunts Anton and breaks the harp. An upset Anton exits the room and decides to go down the beanstalk. Prince James has a female visitor who is dressed in white lingerie. Their romantic interlude is interrupted by James’s father King George. The king tells them there is no time for this as there is a giant lurking about. Anton peers into a tavern and looks on at the humans. James and his female companion find him. They are friendly so he introduces himself. He tells them that he is fascinated with humans. The woman hands something to Anton. She explains that it comes from the land of the Jabberwocky and when eaten can alter size. She introduces herself as Jack. He thanks her. Anton is now human size and enters the tavern with James and Jack. He confides in the two that his brothers are cruel and often tease him for his small size compared to other giants. They comfort him as he is delighted to see humans playing a harp. James gets up argues with a barkeep and Jack tells Anton that the kingdom is in financial trouble. She tells him that neighboring kingdoms are threatening to burn them. She implies that magic beans may help and he tells her that he may be able to get them treasure. Anton returns home and goes to gather up jewels and treasures. He is interrupted by Carlos. Carlos tells him that his brothers all love him and that humans are not to be trusted. Carlos is alarmed when he realizes that Anton may have led humans to the beanstalk. James and Jack have traveled up the beanstalk and confront the giants. Anton quickly finds out that they have lied to him as Jack admits they are not his friends. They have come for the beans and are ready to fight. James and Jack use poisoned swords to defeat the giants. Carlos tells Anton they are the last two of the giants and that the beans must be hidden from the humans. Jack interrupts them as she stabs Carlos with a poisoned sword. Carlos picks up Jack who screams for help from James. Carlos uses the same sword to stab her. He drops Jack on the ground. James carries a bag of treasure and a poisoned Jack is stunned he is set to leave without her. He coldly tells her he has a kingdom to run. James leaves Jack to die as Carlos gives a small vile to his brother. He tells Anton that this is a piece of the beanstalk and one day he will find the right place to plant it. Carlos dies. Mr. Gold/Rumpelstiltskin arrives to pick up Emma. Emma informs him that with Cora in town Henry will be joining them. At first Gold wants no part of this but then agrees. David tells him to keep his family safe. The three drive away and pass through the border. Gold keeps his memory. David is getting used to carrying a gun. He tells Mary it is different than carrying a sword. There is a knock on the door and it is me. I play dumb and tell them I did not kill Archie. They tell me they know and that they have not been able to reach me. I tell them I came to see Henry. I am then informed that Emma took Henry on her little voyage with Gold. I am annoyed but there is nothing I can do at this point. Hook limps alongside Mary, David and Leroy. He cannot resist making inappropriate remarks to Mary which annoys David. They want to know where the concealed ship is so that they may find clues about Cora. He leads them to the concealed boat. Leroy asks if the ship can take them home. Hook explains that the ship must go through a portal. Hook uncovers a cage with a person inside. It is a human size Anton. David wants to know what the meaning of this is as Hook explains it is a shrunken giant. Mary wakes Anton who introduces himself. Tiny/Anton is upset over his size and tells them a witch cursed him. Once he sees David he becomes enraged and attacks him. Mary points a bow at him to make him stop. Anton yells at David that he will pay for what he did and runs off. At the hospital Belle watches TV. Ruby comes to see her and brings a basket. She introduces herself as a friend that Belle does not remember. She has also brought her the book ‘The Mysterious Island.’ Belle tells Ruby that she saw a man create a ball of fire after healing her wound. Ruby tries to convince her that the drugs are making her think this. The angers Belle who begins screaming and insisting she knows what she saw. A nurse comes out and sedates Belle. Belle is taken back to her room. Greg Mendel has seen part of the scene and Ruby pleasantly tells him she hopes he gets better so he can go home soon. David and Mary try to figure out why the giant is so angry with him. A thought comes to him. He realizes that something must have happened between Anton and James his twin brother. At the airport Gold is visibly nervous. Henry asks him many questions and Emma tells Henry to stop. Gold is alarmed when he is asked to remove his shawl before going through the body scanner. Emma pretends Gold is her nervous father and whispers to him that she won’t let anything bad happen. They go through. Hook is picking things up off the ground. I surprise him. I tell him that my mother Cora wants to know if he removed her belongings off the ship. He tells me that they have seen the ship and already know she is here. He then updates me that the giant is loose and wants to kill David. This pleases me as this could work as a distraction. I find Anton. I assure him I am here to help him. I tell him I know he wants to kill someone and I have something for him. I offer him a piece of magic mushroom. I tell him it will get him back to his original size so he may complete his mission. Gold paces at the airport. Emma and Henry look relaxed but she can see Gold is not. Gold tells them that he will be right back. He flies into the bathroom and enters a stall. Inside the stall he begins pounding the metal seat cover holder on the wall. Once he stops he looks at his bloody knuckles. Gold tries to use magic to heal his wounds but nothing happens. He hears Henry call for him that their plane is about to board. Anton is destroying the street. David pleads with him to listen. He tells Anton that he had a twin brother and he believes that is who Anton is angry with. He tells Anton James is dead. Mary steps in and tells him that they are Emma’s parents and she knows he trusts Emma. Anton agrees he will talk to Emma and is angered when Mary explains that she too in unavailable. They run away from Anton and David finally stops. He tells Mary that he wants to sacrifice himself to save everyone else. He calls out to Anton and offers himself as a deal. Anton accepts but as he is about to stomp on him, Mary pulls David out of the giant’s way. Anton disappears in a cloud of smoke. They are confused and peer over a hole in the ground. Anton has returned to human size and is hanging onto a pipe. The town bands together to save Anton. David is lowered into a pit and instructs Anton to grab his hand. At first he refuses telling David it may be better if he just dies. David insists he take his hand. Anton finally does and is surprised everyone helped save him. They head to the Diner. Anton is reluctant to feel chummy with anyone. Leroy tells him he will fit in as they are all displaced from their real homes. Anton pulls out the vile and shows them he has a piece of the beanstalk. He suggests that maybe they can plant it and everyone will get home. The people are happy except for Mary. The dwarfs take Leroy to some land. They give him an ax and a new name. He tells them that he wants to be called Tiny as that is what his brothers called him. David asks why he too did not get an ax and Leroy tells him because he is not a dwarf. Tiny joins the other dwarfs as they sing and break the ground. Greg goes to Belle’s hospital room. He tells her that he is the one who was driving the car in the accident. He tells Belle that he overheard her conversation. She asks if also thinks she is crazy. He tells her he does not as he saw the ball of fire too. David and Mary walk after leaving the Diner. He tells Mary that he wonders what he would have ended up like had he been the one raised by King George. She tells him he has a different heart than his brother. She then tells him she enjoyed the adventure they had during the day as it was like old times. He tells her if they can use the beanstalk to go home it can be that way again. Mary admits that she does not want to leave because of Emma and Henry. Gold is terrified on the plane. Emma and Henry appear more relaxed. Emma notices Gold’s bandaged hand. She reassures him telling him things will work out and he will find Bae. I’m serious! One minute, he’s growing magic beans with the dwarfs, Regina tracks it down and fireballs the heck out of the whole field of beans, and we never see Tiny again. Why? 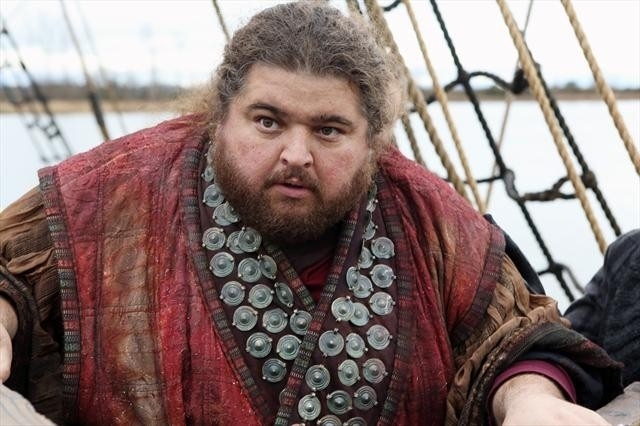 I really enjoy Jorge Garcia as an actor and was thrilled he was cast as ‘Tiny.’ I understand he is involved in another project. But, the writers never wrote any closure for his character. Thus, he is still wandering around Storybrooke … somewhere. P.S. : Who did Cora kill (which fairytale character) and was interred in Dr. Hopper’s grave? As we all know, Dr. Hopper was being held captive on Capt. Hook’s ship. Regina asked her mother who was in the grave, as Hopper was being held captive. Cora’s reply being she didn’t know nor care. Just someone from the streets of Storybrooke. Regina shrugged her shoulders, concurring with her mother … and nothing more was said of it. Soooooooooooooooo … which fairytale character is in Hopper’s grave? (and why on earth didn’t Dr. Hopper insist that the grave be dug up, casket and tombstone destroyed, as it would be creepy as heck to be walking around knowing your name is on a tombstone in the cemetery ….. only to find — dun, dun, duuuuuuunnnnnnnnnnnnn — ___________________________ [insert name here]) Who was it??? ?